After careful consideration, we've decided to discontinue the For Life collection. The last day to purchase a For Life product with a lifetime guarantee is March 26 2018. Please register the product immediately, because your last chance to register, or activate, your For Life product is May 25 2018. WE'VE LAUNCHED a collection called Hard Life, with products very similar in performance to the For Life range. However, the products do not come with lifetime guarantee. Are you a current For Life owner? We will still honor all our existing For Life guarantees for products purchased before March 26 2018, and registered by May 25 2018. If you need to make a claim, go ahead and click the yellow button below. When we have received your email and approved your claim, you will be required to pay the FOR LIFE administration fee. The fee is currently £20 for UK customers and €30 for European customers. You will be required to pay this before your replacement footwear is ordered. Please note that replacement footwear is subject to stock availability. If you claim is approved we aim to have your product back to you by secure carrier; whether replaced or repaired, within 6 weeks (either from receipt of the administration fee or receipt of the product whichever is the latter). *The FOR LIFE guarantee only applies to the Dr. Martens FOR LIFE products. We have added weight and thickness to the inner core of the sole and used a highly resilient and supple leather called Hardlife. With a little help from you, these boots and shoes will give you a lifetime of wear. Without proper conditioning, even the finest-quality leathers, like those in the for life products, will eventually dry and lose their durability. Take the time to care for the leather - and you'll be rewarded with a pair of boots or shoes which will not only keep their looks, but last for years to come. 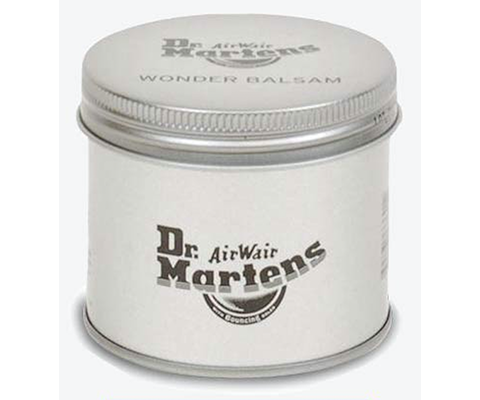 When dry, apply a small amount of Dr. Martens Wonder Balsam to the leather, in an even layer, using the sponge provided. Ensure that the balsam is worked into the seams. Leave the wonder balsam to absorb for five minutes.